Ranolazine 500 SR tablet: Each film-coated sustained release tablet contains Ranolazine INN 500 mg.
Ranolazine has anti-ischemic and anti-angina effects that do not depend upon reduction in heart rate or blood pressure. It does not affect the rate-pressure product, a measure of myocardial work, at maximal exercise. Ranolazine at therapeutic levels can inhibit the cardiac late sodium current (INa). Thereby it causes decreased influx of Ca++ through Na+-Ca++ channel. Thus, it inhibits Ca++ overload and decreases oxygen consumption of heart. 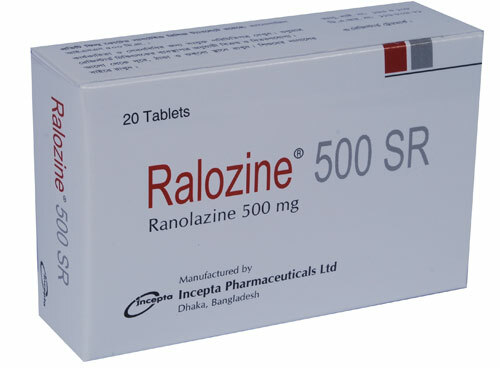 Ranolazine is indicated for the treatment of chronic angina. Ranolazine may be used with beta-blockers, nitrates, calcium channel blockers, anti-platelet therapy, lipid-lowering therapy, ACE inhibitors and angiotensin receptor blockers. Initiate Ranolazine dosing at 500 mg twice daily and increase to 1000 mg twice daily, if needed, based on clinical symptoms. Take Ranolazine with or without meals. Swallow Ranolazine tablets whole; do not crush, break or chew. The maximum recommended daily dose of Ranolazine is 1000 mg twice daily. If a dose of Ranolazine is missed, take the prescribed dose at the next scheduled time; do not double the next dose. Heart rhythm problems (e.g., bradycardia, QT prolongation, ventricular tachycardia), liver problems, certain uncorrected mineral imbalances (low potassium/magnesium levels), severe kidney problems.